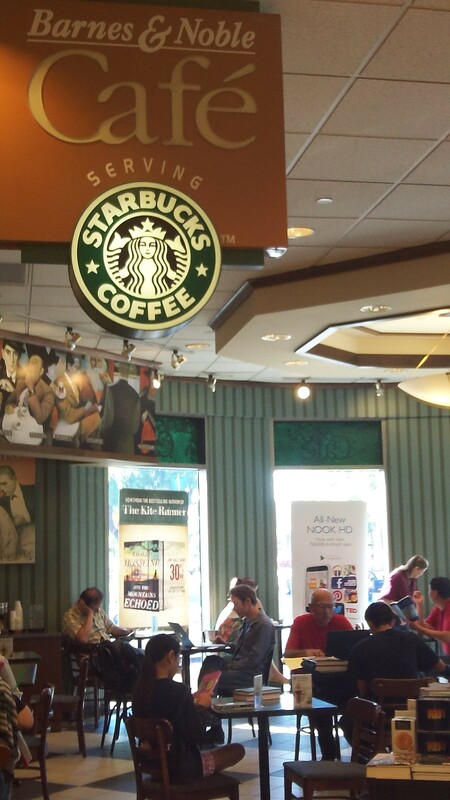 A misconception I see on Yelp Reviews, is that there is a Starbucks inside the Burbank Barnes & Noble. They “serve” Starbucks coffee and beverages but it is not a Starbucks, it is the Barnes & Noble Café. Glad that is clear now. I’m making a point of this because they do not accept Starbucks cards, so Bookworms beware. You ought to go to the one located on San Fernando Road, but South of the Mall, they will gladly take your Starbucks card, but Coffee Junkies beware, there are no books to browse. Whether it’s coffee, books or trinkets you like, find it all at the Media Center Barnes & Noble in Burbank. The soups good. I had the Tortilla Chicken and really enjoyed it. It does get somewhat busy and crowded at times, with chair jockey’s that look like they’ve slept in their clothes. Well, there’s free Wi-Fi, I guess that’s why. No electrical outlets, that I could find, so be battery ready…and good luck finding a seat. They do have nice events such as the Over 50, or Beyond 50 Book Club, The Writer’s Circle and Saturday Book readings for the kids. Check out our events page. All in all, it’s a noble idea for gift buying, book browsing, and sipping coffee, with or without a Starbucks card. Actually, without. 731 N. San Fernando Blvd.